In Italy, cooks know how to make the most of shellfish by tossing it into pasta and rice preparations. 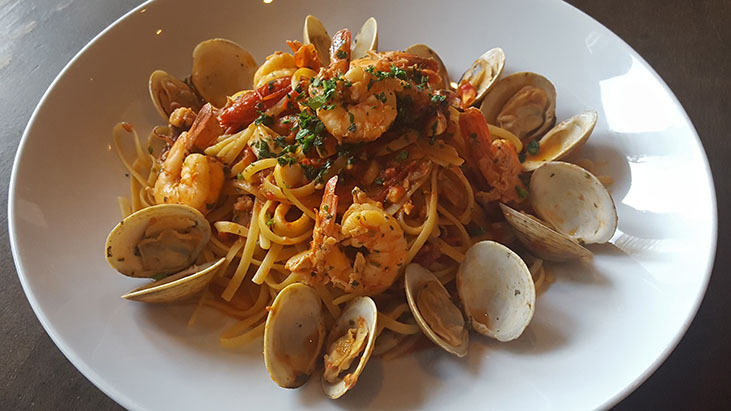 At Baraonda restaurant in Atlanta, the kitchen cooks shrimp, clams, mussels and calamari in a garlicky sauce to combine with linguine for the restaurant’s take on a classic Italian dish. Place 10-inch saute pan over medium-high heat; add half the olive oil to a depth of a 1/4 inch. When oil is hot, add garlic and crushed red pepper; cook 2 minutes or until garlic is golden. Turn heat to high and quickly add canned tomatoes; cook until reduced by half, stirring with back of a spoon or fork to crush tomatoes. Reduce heat to low; add about 1/2 cup clam juice, 2 tablespoon of parsley and salt and pepper to taste. Continue cooking over low heat, adding a more clam juice if necessary. In another large saute pan over medium-high heat, heat remaining olive oil. When oil is hot, add shrimp and sear on both sides. Cook shrimp until halfway done; remove from pan. Reduce heat to medium; add clams. As clams open, remove from pan. When all the clams have opened, deglaze pan with white wine, evaporating most of the wine from the pan. Stir tomatoes into pan; add back shrimp and stir in calamari. Add mussels and cook until they open. When mussels open, add clams back to pan. Finish with remaining parsley. To serve, toss shellfish mixture with hot linguine.